I wanted to serve a few things that were a little different at our office Christmas party this year. I was also looking for recipes that could be made ahead of time. I have seen recipes for candied nuts before, but I wanted to find something a little different than that. 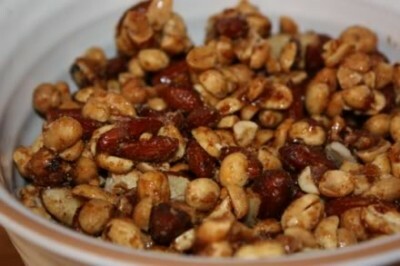 I knew I had tasted spiced nuts before and I was sure they would be easy to make. I searched online and found a recipe for spiced nuts on Martha Stewart’s site. They were easy and a little different than your regular candied nuts. The directions also said that they would store up to two weeks. These would work perfect for what I needed. I made these up and my husband loves them. In fact I might have to make another batch of them because I do not know if there will be any left by Friday. I did change the recipe just a little by cutting back on the spices. Martha’s recipe was spicy. I could tell that by reading the recipe. But I also read through the reviews of the recipe and many people thought that they were too spicy. So, I cut back on that a little. I you want the really spicy just add more chili powder or add ground red pepper to it. At first I was disappointed in these because I did not think they were get firm and crunchy, but they did. Just be sure to let them sit at least 24 hours before you need them. They will crisp up as they sit and cool. These would be great to give as gifts for the holidays. You can place them in a decorative tin or container and they would make a nice gift to give someone. Preheat oven to 300 degrees. Beat egg white until soft and foamy. Combine all remaining ingredients except pecans; whisk into egg white. Stir in pecans/nuts until well coated; spread mixture in single layer onto an ungreased baking pan. Bake pecans/nuts for 15 minutes, then remove from oven. Using a metal spatula, toss, stir, and separate nuts. Reduce oven to 250 degrees. and return nuts to bake until medium brown, about 10 minutes. Remove from oven; toss, and stir again. Place baking pan on wire rack to cool (they will crisp as they cool). Break up any that stick together; store in an airtight container, at room temperature, up to 2 weeks. Thanks for the recipe! I’m going to try it. Yum! I love nuts, any type, so this looks perfect! I really like these! I’m hoping to make some for family this year. Thanks for sharing.